The dandelion is a flowering plant believed to have roots in Eurasia. The word “dandelion” is a corruption of the French word “dent de lion” or “lion’s tooth”, which refers to the plant’s jagged, toothy leaves. Though commonly used for ornamental purposes, the dandelion is a plant with heavy use in folk medicine. Dandelions are rich with highly beneficial antioxidants that diminish free radical damage. Vitamins C and A, vitamins with detoxifying properties, aid in the detoxification process by boosting the liver’s production of superoxide dismutase, an enzyme that breaks down harmful oxygen molecules. Furthermore, these antioxidants work together with essential fatty acids and phytonutrients to reduce inflammation all throughout the body. Pregnant women and mothers may turn to dandelions as these herbs can also serve as galactagogues, foods that promote lactation and make feeding easier. Jaundice, a disorder of the liver wherein bile is overproduced, can be mitigated by dandelions. Treating jaundice entails three steps: curbing bile production, eliminating the excess bile from the body, and fighting the viral infection. Dandelions do all these by regulating bile production, encouraging urination, and by acting as a disinfectant and antioxidant. The diuretic effect of dandelions may help in weight loss. By increasing urine output, water weight is decreased. Since dandelion herbs can induce allergic contact dermatitis, sensitive individuals should be cautious when using them. Patients undergoing potassium-sparing diuretic therapy are also advised against dandelions since they may aggravate potassium toxicity. Tenacious and common in back and front yards, dandelions can simply be plucked from the ground if they’re unavailable in vitamin shops or health food stores. The easiest way to consume dandelion is to take it as a tea. There are two types of dandelion tea: tea made from roasted dandelion roots and an infusion of dandelion leaves. The iron-rich dandelion greens can also be used as a vital ingredient in all kinds of recipes, ranging from a dandelion pumpkin seed pesto to an artichoke, kale, and ricotta pie. Dandelions are rich sources of antioxidants. These herbs are recommended for pregnant women and mothers as it increases lactation. 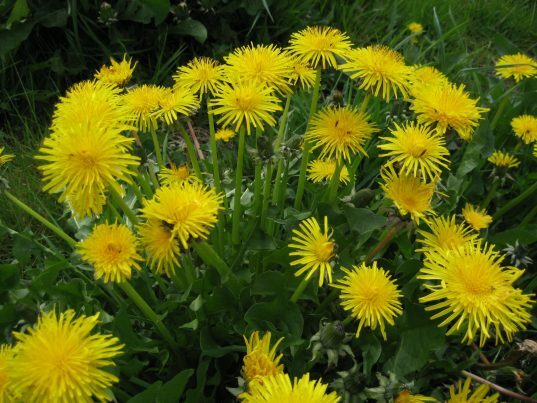 Dandelions can mitigate the effects of jaundice. Sensitive individuals should take care when consuming dandelion herbs. Dandelions are particularly used as a blood purifying herb.